The drop in market share is perfectly understandable -- newspapers have been spending almost nothing on building circulation. So how much is due to that and how much is due to new technology that newspapers choose not to invest in? Look at what we used newspapers for 20 years ago. In addition to news, newspaper were also used for everything from finding a job to finding a movie, from recipes to comics to crossword puzzles. Seriously mull it over. Now think about how many of those things are delivered today simpler, faster and more conveniently in an online or digital format -- often right to your phone no matter where you are? Worse (for newspapers, not for consumers), consider that most of those things are delivered simpler, faster and more conveniently by companies that are not and never were newspapers. Now consider the overall lack of serious investment in digital delivery that the industry formerly called the newspaper industry has exhibited over that 20 year span (full disclosure: I'm a 16 year veteran of newspaper online ventures) and explain to me how the result could be anything other than what it has been. All of this is true - but much of the collapse in the major markets is self inflicted. 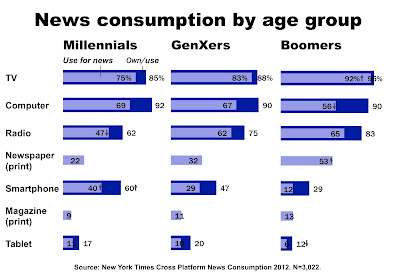 The executives need to stop thinking of themselves as heading newspapers, which do indeed face serious competition, and, instead, think of themselves as heading news organizations which have virtual monopolies on the generation of news. For example, to this day most newspapers remain members of the Associated Press so that the news they generate is then provided to their broadcast and Internet competitors without compensation. Look at it this way: General Motors does not provide cars for Ford to sell; but most major market newspapers provide news to their local broadcasters and the Internet to sell and are not paid for it. It is hard to change the mindset of long-time print executives. A better way for directors is to hand them a list of the necessary changes and get on with making money. In essence, it's time for a new approach to news in the major markets. The investors in our company think it will be highly profitable because the demand for news and information is insatiable. We are willing to invest substantial monies in any major market served by only one daily - not because we like newspapers but because we think their news organizations will be highly and permanently profitable if (repeat if) properly managed and monetized. I still read newspapers, but now the problem is having spend an increasing amount of money for a product that is slowly sinking in size. To whit, one of my local newspapers out here just increased their price to $1 for a daily, but the total page count remains around 40. Newspapers still get (Gawd knows how...) $450 dollars per paid subscriber per year ad revenue. Facebook gets $4. Newspapers committed suicide when they chose to give away their news product on the internet years ago. No other industry has ever had more skill in gathering, verifying, and editing the news and they could have done the best job of providing internet news with their vast news gathering apparatus, but they made a bad decision to give away the product of their labors without charge and killed their golden goose. There's little chance now of convincing folks to pay for what has been free, so accurate and verified news and the industry that provided it is going the way of the dinosaur. Sad.